Bankruptcy is a legal procedure involving an individual or business, who is unable to repay the outstanding debts. 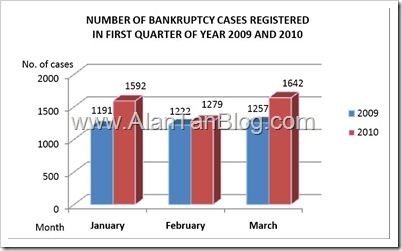 According to Malaysia Department of Insolvency(MDI), total number of bankruptcy cases register as at 31 May 2010 is at 217,577. MDI is a premier government agency leading the national administration and regulation of insolvency matters in Malaysia. Bankruptcy is a very fearful word as you’ll lose a lot of freedom by being a bankrupted person. When a person is declared Bankruptcy, the Directory-General of Insolvency will handle and take possession of all books of documents and account relating to their financial affair or property. Any person who cannot pay a debt of RM30,000 can be declared a bankrupt under Bankruptcy Act 1967. Only after five year of bankruptcy, he or she can apply to the Directory-General of Insolvency(DGI) for discharge. The DGI will consider the cause of bankruptcy, the bankruptcy’s payment to all his creditors, bankruptcy tenure, health and age of the bankruptcy and the level of cooperation given in the administration of his affair, before decide to discharge a bankruptcy case. In 2010, the number of individual bankruptcy cases rose 11.2% to 18,053 cases from the year before and increased 6.2% to 19,167 cases in 2011. This year, in the first three months alone, 2,870 cases have already been recorded by Bank Negara Malaysia (BNM). What Are The Restriction A Bankruptcy Will Face? Cannot leave the country except with DGI’s permission. You can forget about taking an overseas holiday tour. Cannot be a company director or take part in the management of company. Cannot be nominated for an elections. Cannot maintain any action except with sanction of DGI. In order to avoid being declared a bankruptcy, it is wise to get educated about financial literacy and understand the basic of principles of finance. Don’t let the lack of knowledge in personal finance management to become an issue to you. I’ll blog more about personal finance more in the future so do visit us. This entry was posted on Thursday, June 7th, 2012 at 7:28 pm	and is filed under Tips. You can follow any responses to this entry through the RSS 2.0 feed. Both comments and pings are currently closed. Car loan defaulters top the list of people declared bankrupts. Minister in the Prime Minister’s Department Datuk Seri Mohamed Nazri Aziz told Parliament there were 29,338 bankrupts under this category from 2005 to April 2012.